Here is one of the most important and often overlooked things new bloggers don’t do – growing your email list starting NOW! I wish I would have started building my email list sooner. If you’re not building an email list from Day 1, you’re making a HUGE mistake. 1 What’s an email list? 2 Why would I want to build an email list? 3 Who are you going to sell it to? You’re probably on a few (or a lot) of email lists. In fact, you’re a part of my ‘Get Started Blogging’ email list where I send you this great blogging information each day. An email list lets you collect the email addresses of your website visitors so that you can contact them later on. Why would I want to build an email list? You might think the most important part of blogging is having people visit your website. Visitors mean more advertising revenue TODAY, right? While having people visit your website is important, being able to connect with your visitors in the future is ten times more important. It’s also worth ten times more money. Pretend for a moment you’ve been blogging for eight weeks and now you have enough content to put together an awesome eBook. How will you sell it to all those people that have been visiting your blog for the past eight weeks? How will you get them all to come back so you can tell them about your amazing new eBook? Unless you have a way to contact them – you can’t. 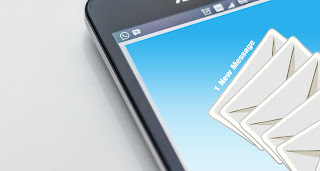 Email is the #1 way to connect with your readers. The reason email is king, is because everyone reads their email. Compare that to a Facebook post where someone may or may not receive it. When was the last time you didn’t at least read the subject of an email before you deleted it? At the very least you saw every email you received. I hope I have you convinced to start collecting email addresses. Stick with blogging, and you’ll build an email list that has 1,000, 10,000, 100,000 or more names on it. Say you’ve put your eBook together. Or you’ve got a recommendation for a great $100 product that you get $30 in affiliate commission. The money starts rolling in. In return, you earn money for helping them. It’s win-win. When Katie & I ran our green building training company, we built an email list of over 100,000 paying customers. Each time we would come up with a new product we emailed the list to tell them about it. We were helping them learn new things that would improve their careers (better jobs, more income, promotions). During new product launches, we could make $10,000 in 48-hours by emailing our list announcing the product. And remember – as an affiliate you don’t even have to make products. Some bloggers like Pat Flynn over at Smart Passive Income earn over $100,000 in affiliate income each month just by recommending other people’s products. Email service providers maintain your email list for you. For instance when a website visitor wants to sign up for your newsletter to stay in touch with you. The provider gives you software tools that let you add the newsletter functionality to your website. MailChimp is free to get started, and it’s free for your first 2,000 subscribers. That’s a deal! You’ll find some people recommend AWeber. When I first started blogging I used AWeber too. So many other people said ‘use AWeber!‘. I have a sneaky suspicion why – because AWeber has an affiliate program! People make affiliate income when you sign up with AWeber. MailChimp doesn’t have an affiliate program. I get paid nothing if you use them. Remember when I talked about being honest in your product reviews and how that honesty will help build you a loyal fan base? I just gave you an example. Recommending the best product to you (MailChimp) is more important to me than earning an affiliate sale from AWeber. As someone who has used both products, I found MailChimp to be much easier to use. ConvertKit is a product with a much higher price point ($79/month). As I’m writing this, I’m evaluating the product. You don’t need to invest in bigger and better services until you start making money blogging. I’ve been using MailChimp for over a year, and I love it. But my fellow bloggers that have been blogging for a while (2+ years) are moving to ConvertKit. So I’m going to see what all the hype is about. Keep it simple and free – go with MailChimp. If you’ve ever signed up for a newsletter – why did you do it? You have to come up with a compelling reason to get a blog visitor to give you their email address. For every 100 website visitors, you’re doing well if you can get two email addresses. A 2% conversion rate – that’s your goal. Anything higher and you’re amazing. Anything lower and there is room for improvement. Ask yourself – what would be the reason? There isn’t one. Sign up for my monthly newsletter and I’ll send you amazing coupons to save money on your groceries. Plus if you sign up I’ll email you a cookie. The frequency is clear – The newsletter will be sent monthly, so the subscriber knows when they can expect to hear from you. You show the benefit of subscribing – Your coupons will save them money. You’re helping them solve a Challenge – everyone wants more money. You show personality – Everyone knows you can’t email a cookie. By sounding like a human instead of a boring company, you build a connection with your readers. Come up with an offer to get people to subscribe. It’s been proven if you have a free offer (something of value) people are much more likely to subscribe. Your offer doesn’t even need to be unique. You can take a blog post or posts you’ve already created and re-package them into a free giveaway. This blogging course that you’re in showing you how to make money blogging. FREE! – You can’t beat free. The basic templates are all free. If you want to get fancy someday you can upgrade to a paid account. Connects to your MailChimp account – You’ve got a free email collection tool that connects with your free MailChimp account. Isn’t blogging amazing and cheap? Tons of Features – SumoMe comes with 12+ free tools to grow your website and to collect email addresses. My suggestion is to install all of the email collection tools and see which ones work best. I tried all three on my blog when I got started. I have since scaled it back to just having a single popup that appears when someone is leaving my blog. The single popup works well for me based on the results I’ve measured over time. Building your email list is super-important. Sign up for a free account at MailChimp to store email addresses. Sign up for a free account at SumoMe to collect email addresses.